A wise (and experienced) fund manager once told me that “if the market is weak, it responds to bad news with weakness . . . if strong, it ignores it.” It was one of those weeks. Continued bad news out of the Ukraine and poor economic news out of China. As I’ve said many times before, once we’re at the upper channel lines (purple) of this trend, we’re susceptible to corrections; the risk is at the top of the channel. 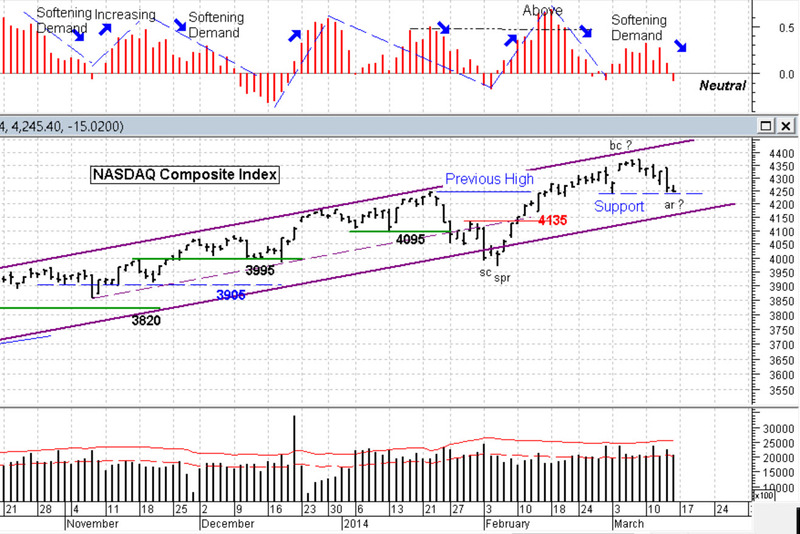 So not surprising, bad news near the top of this channel brought on selling. We could see this coming with those narrow range bars toward the top. This indicates selling (nearly) equal to buying, so price goes nowhere. In context (i.e. at the top) the next move is likely down; and it did. And so what the market does from here will either confirm or deny this structure scenario. We could see an Upthrust next with prices going back toward the highs but on very light volume. That’s our chance to exit gracefully and sit back and wait it out. High volume up bars would call that into question though. The other possibility is that we just continue down. And that could for tell a possible larger price structure (with capital letters). A major top / Distribution structure will take longer to develop and confirm. Something to be seen on weekly charts as well. This Bull market is in its 5th anniversary and is the 6th longest in history, being the 4th largest (in % gains) of all time. Thus seeing a larger price structure develop would not be a surprise for us . . . . would it? For now, we “Stay in the Now” and only trade what we see, not falling into the trap of predictions. As it is said: “Even a broken clock is right twice a day.” and those that predict are only sometimes right (but that’s all we hear about). Is there anything doing at least OK now? Yeah a few. 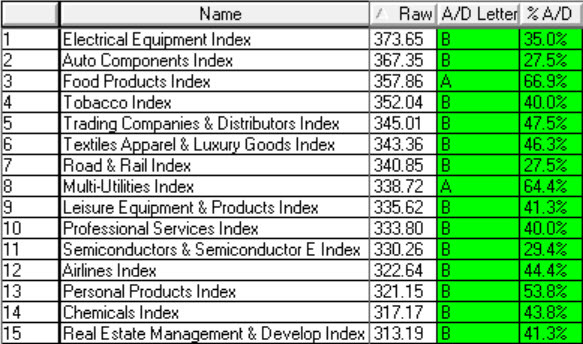 Top sector table is below.